Installing php-mcrypt should be a cakewalk on Mac OS X with brew using the command "brew install php54-mcrypt" but at times things do not work out this easily and that is when you have to end up building and installing php54-mcrypt manually. It is an easy process and here is how you can do it. Another way to install PHP-Mcrypt is using Macports. You might get an error that says cowardly refusing to sudo while using brew, that can be easily fixed as well, see this. Step 2: Download and extract PHP using this link into a folder. 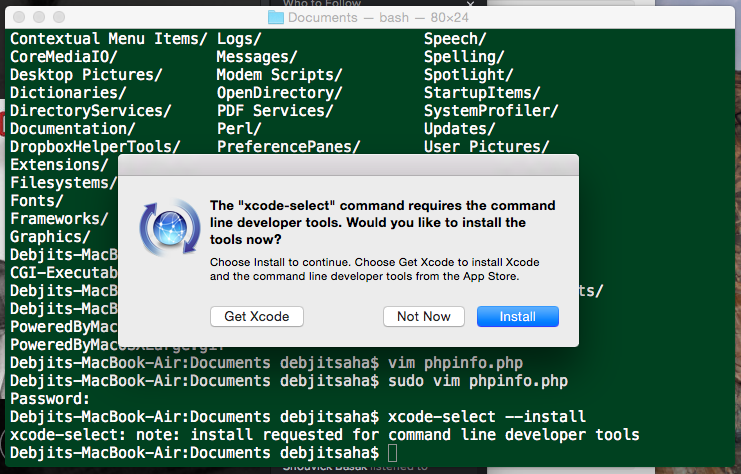 In the above series of steps,if for some reason you get blank outputs from the various property values after running the /usr/bin/phpize command, then you need to install xcode developer tools before proceeding further. Here is how you do it.